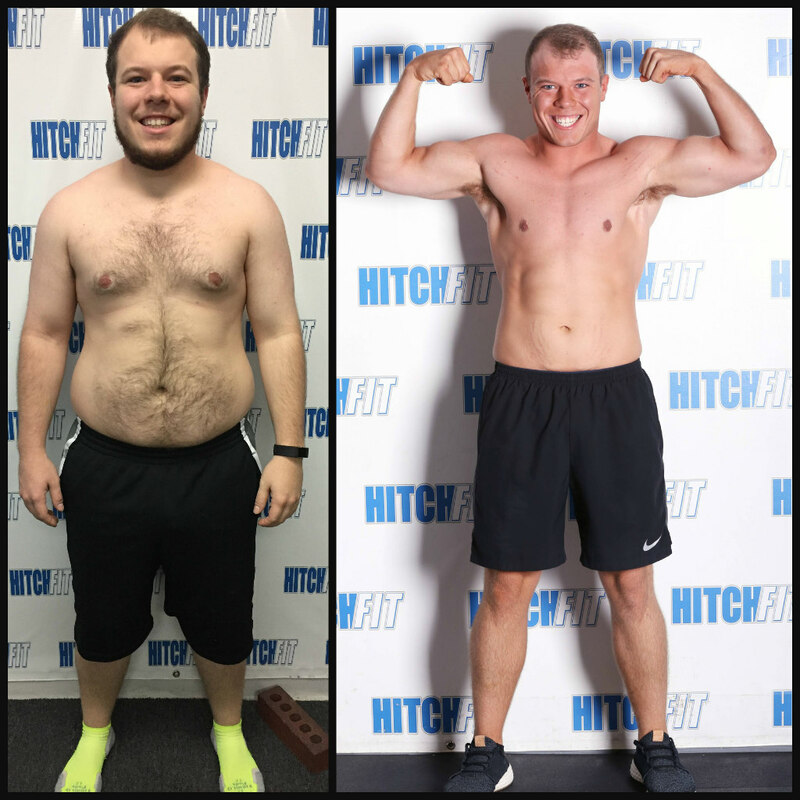 55 Pound Weight Loss Story at Hitch Fit Gym! “In high school, I was always involved in sports and other athletic activities. I had always been overweight, but just thought being overweight was normal for me and not something I could change. After high school, I continued to eat like I always had—whatever I wanted whenever I wanted. But without the exercise, I started to gain weight. By the time I started my diet, I was at the biggest I had ever been. I felt constantly tired, I was very self-conscious about my body, and I was depressed. I started Hitch Fit about a month into my self-imposed diet. I was somewhat successful on my own, but felt that I needed help with my nutrition. I was at an advantage because I knew a lot about weightlifting, yet I knew nothing about good nutrition. After looking up and visiting many different gyms in the area that focused on the nutritional aspect and finding nothing that I thought was worthy, I read about Hitch Fit. 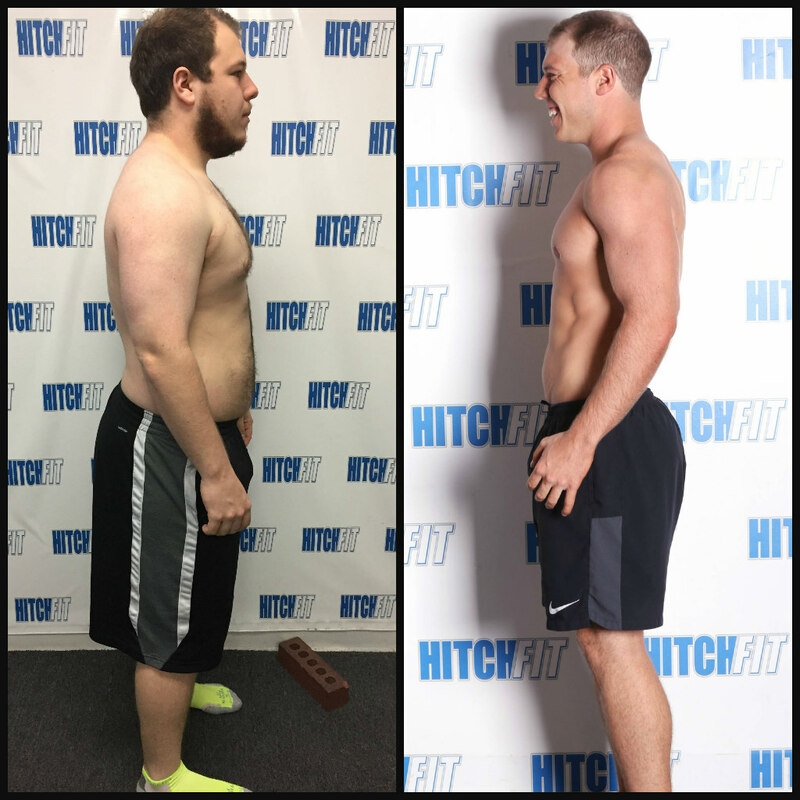 After meeting my trainer—Eric Reynolds—and going through the basics of our plan and how the Hitch Fit program operates, I was confident and happy that I found exactly what I was looking for. 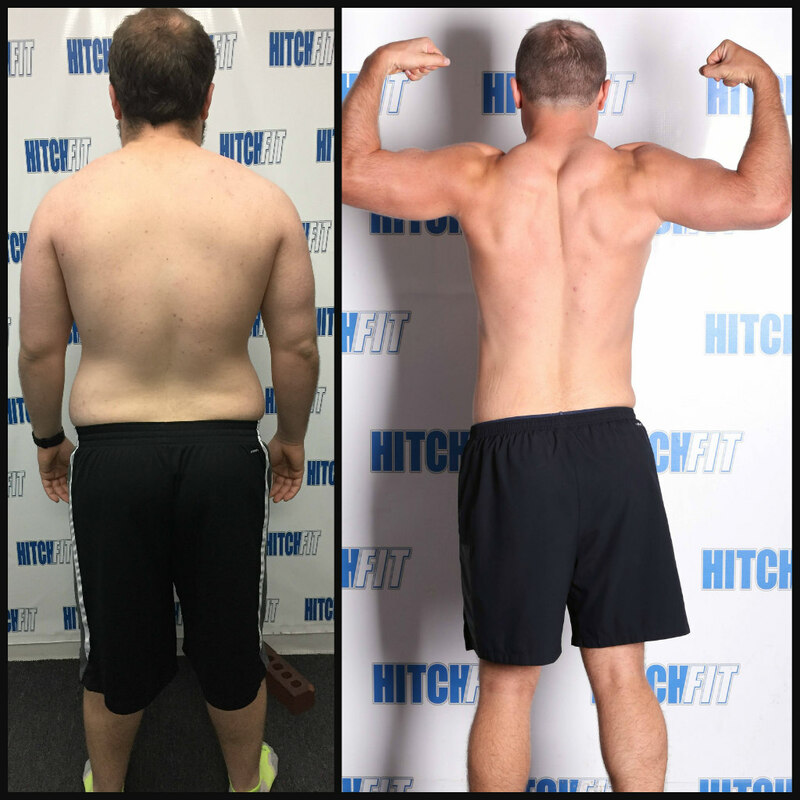 When I signed up for for Hitch Fit Personal Training, I just wanted to lose weight and see where I could be in 12 weeks. I thought that if I could just put one semester of school worth of work into my health, I would be proud of myself. I had no expectations when I signed up other than to complete the initial 12 week program. I did not even realize how far I had actually come until I was almost done. I was enjoying myself so much and had built up a routine with both my eating and exercise that it had become second nature. My realization didn’t happen until a friend of mine posted a picture from a little over a year ago on Facebook, and I could not even tell that it was me in the picture. I had become a totally different person…and it was all for the better. I enjoyed my meal plan. I felt that the structure actually made it very easy to follow. The most difficult part was the second week, because that is the week that you are tested on your commitment to follow the diet plan. After the second week, things were a breeze. Towards the end of my transformation, my meal plan had changed a few different times. I would welcome the change but the foods I was eating were chosen like clockwork. I knew what I liked and I had no cravings for anything that wasn’t allowed on my meal plan. It was an awesome feeling because I wasn’t even aware I was dieting! I learned from the nutrition plan, if you don’t like something, don’t force yourself to eat it. Nothing ruins a diet faster than punishing yourself by forcing food down. Eat the things that you like. Learn to meal prep. It’s not hard and it makes it much easier to eat the correct foods throughout the week. Learn the different ways to cook the same item. Chicken can be cooked 30 different ways and all 30 ways are delicious. From Cajun to BBQ, you can be eating chicken every day and not get bored. Eric and I always worked hard in the gym. I had a considerable amount of prior knowledge about weightlifting but he always had something new for me up his sleeve. I was consistently seeing both visual and physical progress throughout my transformation. I always loved Bench Press and shoulder exercises! I felt those were my best lifts and I felt the strongest doing those. We all have obstacles. I did too. I was doing my program during two semesters of full-time enrollment at college! It wasn’t easy but I was determined and kept good grades while still progressing in my transformation! Eric always kept me in check both weekly and monthly. I knew what he expected of me and he helped me to create what I expected of myself. He was always positive and I could tell he was genuinely proud of each and every pound of fat that I lost! I already have recommended others to Eric! He is a great trainer! He is very approachable in and out of the gym and is easy to contact with questions! I am in college and things are constantly coming up or changing times, and he always was willing and able to alter his schedule to fit mine. I don’t know if I would have gotten as far as I have without Eric as my trainer, and I am planning on hitting more goals of mine with him in the future! My transformation has changed my life. I am confident, I am getting better grades in school, I feel a million times better health wise, my peers look up to me and multiple have asked me on advice to help them with their personal journeys. Overall, I am just extremely happy.